" The JCC Camp Scholarship helped give my child an opportunity that they would not have had" Mary V.
There is another side to the JCC that is seen by thousands of non-member Staten Islanders every year,…the side that provides social services throughout our borough to those who need a helping hand whether with food for their table or education for their child who dropped out of high school or health insurance for their family or an afterschool program that is safe and secure as well as stimulating and exciting. You will discover that the JCC is as likely to provide services to the community in a school, a church, a synagogue as it is to offer them in its own buildings. 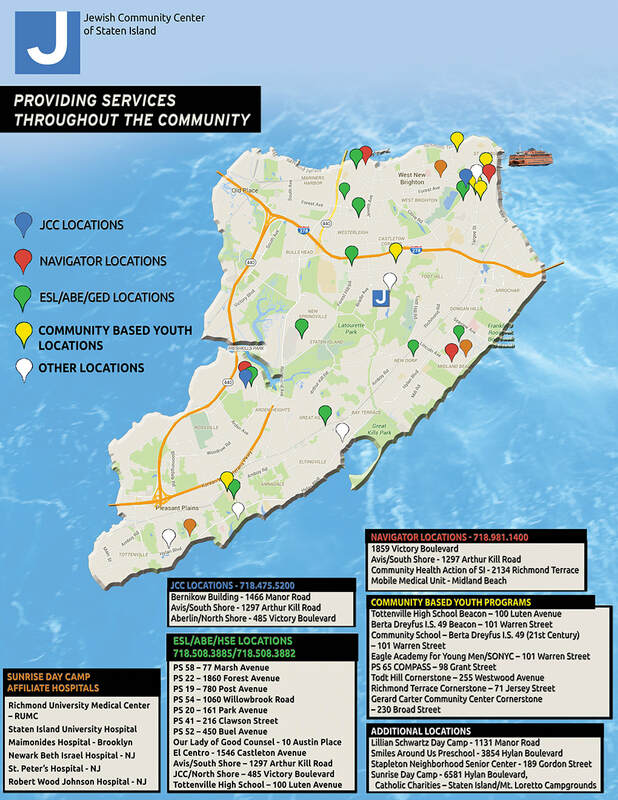 In fact, the JCC is situated in more than thirty different locations, insuring that it brings its expertise and services to locations that are convenient to those who need them. Support us and help improve the lives of children and adults, individuals and families, in ways and places that are less apparent.